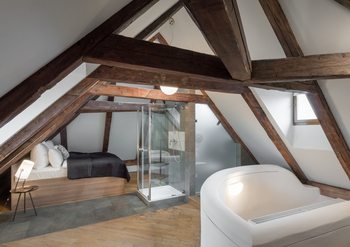 3 Epoques is a boutique apartment hotel located in the oldest building in Prague's Old Town - The Kunstat Palace. 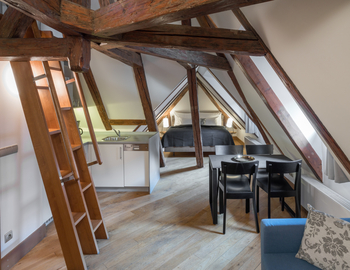 It is located just 3 minutes walking distance from Old Town Square and Charles Bridge. The building has witnessed 3 Epochs of architectural styles (Roman, Gothic and Renaissance). During the 15th century, the building was home to a Czech King, George from Podebrady. His family coat of arms is present on the walls of all apartments to honor and preserve the historical importance of the building. 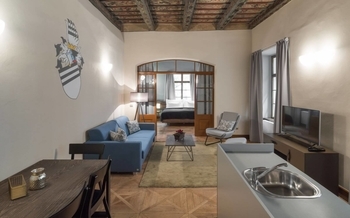 Each apartment offers original interior design with a mix of traditional historical styles and modern, luxury interior will make your stay in Prague that much more memorable. All rates include daily cleaning, fresh towels, bed linens and hotel toiletries. All bedrooms have comfortable King size beds with high-mattresses. Fully equipped kitchens for self-catering are at your disposal in every apartment. There is a 24/7 reception on-site where we will gladly help you with anything you might need during your stay. Private parking is available in the courtyard in front of the residence for an additional fee (advance reservation needed). Very welcoming, clean !! We absolutely loved the size of our room/bed. The apartment was very spacious. Apartment is located right in the city centre only a short distance walk from all main attractions and town squared! Will definitely stay here again in the near future. The apartment was very nice. The location is fantastic. Staff was very helpful in assisting us, and answering any questions that we had. Marketa went above and beyond by arranging tickets for a concert that I was unable to purchase from the USA. I will definitely stay at 3 Epoques in the future. I stayed in 2 bedroom apartment which had a large living room and cozy 2 bedrooms and it was quite enough for 4 people. Nice staffs, kind service(taxi calling service for train station) and perfect location which was just 3 minutes from the Charles bridge. I will definitely choose 3 Epoques again if I have another chance to visit prague. This beautifuly designed apartment offers spacious living areas, perfect for settling down after an active day in the city. It has a Baroque painted ceiling from the 17th century. The whole interior employs a mix of traditional elements with modern furniture and decorations to highlight the rich history of the building. The apartment offers two bedrooms with comfy king sized beds, a modern bathroom and a fully equipped kitchenette. It is ideal for 4 guests, but 2 additional guests can sleep on a comfortable pull-out sofa in the living room. You will love this spacious two bedroom apartment with high ceilings and beautiful design. The whole interior employs a mix of traditional elements with modern furniture and decorations to highlight the rich history of the building. The apartment offers two bedrooms with comfortable king-sized beds, one spacious bathroom and a fully equipped kitchen. It is ideal for 4 guests, but 2 additional guests can sleep on a comfortable pull-out sofa in the living room. 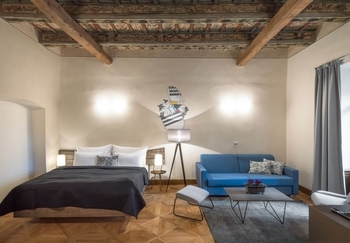 This large studio offers modern interior design with soothing wooden elements, giving a calm and unique atmosphere for your vacation stay. 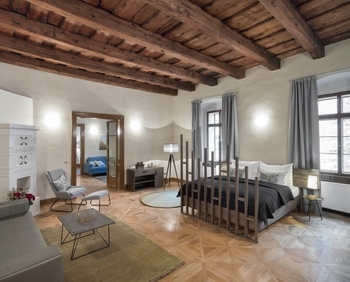 This spacious apartment offers a large room with a comfy king sized bed, a living space on one side and a fully equipped kitchenette on the other. Bathroom has a walk-in shower. It is ideal for couples but can accommodate up to 4 guests using the comfortable pull-out sofa.